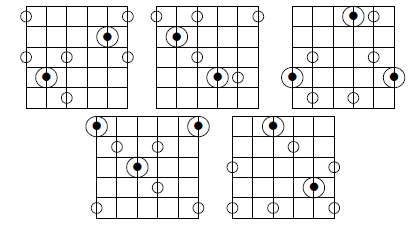 These are two chord/arpeggio structures that come up pretty often once you stray far from the major scale. They also sound great, so they're well worth committing to memory. 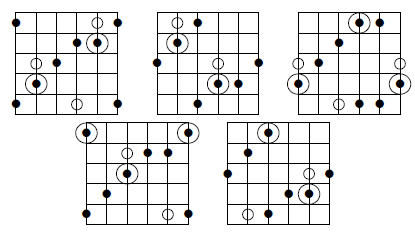 I recommend starting with the triads and then learning the seventh arpeggios separately, because both are useful on their own. It's worth knowing them all as "first class" entities, by which I mean things you can just grab without thinking, rather than as altered versions of the Maj 7 arpeggio you already know. You probably already know some musical applications of this triad. It comes up as an actual chord in some songs (e.g. "Stella By Starlight"). It can be used a semitone below a minor chord to imply the Melodic or Harmonic minor scale, which works very well on tonic minors (not so much on the ii of a ii-V). I also like it as a colour on a Maj 7 chord, where it implies Lydian Augmented, a Melodic Minor mode. And you can play it on a functioning dominant (i.e. the V in a V-I or V-i) too. So any jazz standard provides quite a few places where you can use this arpeggio right away. 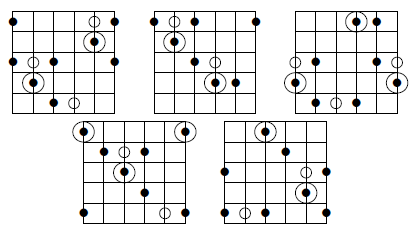 I've found that one thing that needs practice here is knowing where the root is; because the shape is symmetrical, it's easy to get into the habit of playing it "blind" without being aware of which chord tones are which, and that gets you into trouble when you try to apply it in a real musical situation. This web page is perfect for practicing that; try to play the arpeggio in eighths or sixteenths at 120bpm; when the root changes on-screen, go to the nearest note in the new arpeggio without dropping a beat. Use it or its tritone sub on any dominant chord for a mildly altered sound. Played down a major third it will give a pleasant, suspended kind of sound on pretty much any common chord type (maybe minor ii in a ii-V-I excepted) - this is just a matter of making the third of the triad match the root of the underlying chord. So plenty of ways to work these into a standard progression if that's your thing. To play the sevenths all you have to do is add the major seventh note one step below the root. This is pretty easy to do on the fly, but here are CAGED fingerings in case they help. As always, adding a note can cause your fingers to get tangled up at high speeds so don't skip these because they sound easy. These, to my ears, sound extremely cool in many different contexts. You can play Maj 7 b5 in any situation you'd play Lydian, of course, and Maj 7 #5 works well on tonic Maj 7 chords to my ears. There are also tons of modal applications (you can work some of them out just by considering the modes of Lydian and Melodic Minor).